Find out if the Roomba works from a busy mom just like you! I was gifted an iRobot Roomba 980 in exchange for this review. All opinions are my own. Roomba Robot Vacuums are an investment, particularly the Roomba 980 model that retails for $896 on Amazon. They aren’t cheap by any means, but if they really do work I think it’s worth it. Think of all the time and energy are saved by having one. Especially for those families that have pets like we do. My dog sheds so I spend most days vacuuming to keep up with it. Now that I have two kids under the age of five, my time is even more limited and vacuuming during nap time is impossible due to the noise it can make. What’s a mom to do to keep her floors clean for a crawling baby who is into everything! The answer is simple: Buy a Roomba to do the work for you! Does the Roomba work and what can it really do? After owning the Roomba 980 for a month, my answer is clear: Yes, it really does work except for in one area of my home: the living room. Sadly, our rug is too thick and our Roomba thinks it’s a barrier so it can’t go from our hardwood floor to the rug. It has no problem going up and down from hardwood floor to carpet to tile or even on the rug in the playroom. Our vacuuming robot also fits under our beds easily! The Roomba 980 is 13.9-inches across in diameter and 3.6-inches high. It weighs 8.7 pounds and has a built-in handle for easy transport. Other than that downfall, I absolutely love our Roomba and consider it part of our family. We even named it Thor. (You are encouraged to name your Roomba). The time it has saved me vacuuming is outstanding. My husband and I will stand there watching it do its thing in awe. I confess that I get a little too excited about the straight lines it makes and the dirt I empty out of it every time I use it. I guess that is a sign you are an adult, right? It absolutely cleans all floors including carpet, hardwood and tile. Our kitchen seems to get the most mess thanks to messy children. I love that the Roomba is able to get in places I could not normally reach with a standard vacuum. Due to the edge cleaner it can remove dust in hard to reach places. Also, the High-Efficiency Filter captures 99% of allergens, pollen, and particles as small as 10 microns. The AeroForce™ Cleaning System with Power Boost automatically increases power on carpets where it’s needed most. 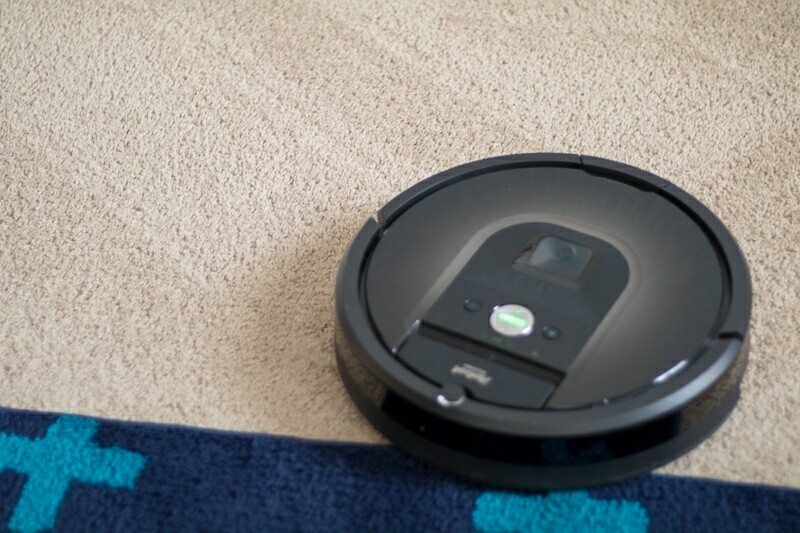 On carpet, On hard surfaces, Roomba 980 reduces its vacuum power to decrease battery consumption. Our labradoodle sheds and pet hair can build up in our home. Using the Roomba has been great to keep up with cleaning it so it does not build up in clumps in corners of our rooms. I am amazed at the amount of dog hair it picks up every time I empty it. Multi-Surface Brushes work together to pull in pet hair, dust, dirt, and large debris without getting tangled. Control with your smart phone – The iRobot HOME App lets you clean and schedule conveniently – anytime, anywhere. With the app, you will be notified if your Roomba ever gets stuck or needs to be emptied. The Roomba is part of the family already. We can also see what areas were cleaned thanks to the iRobot HOME app. iRobot HOME App lets you clean, schedule, & customize cleaning preferences from your smartphone; compatible with Amazon Alexa and the Google Assistant. On days I don’t have time to pick up all the toys from the playroom I set up Dual Mode Virtual Wall® Barriers to tell the Roomba to avoid vacuuming that room. Works like a charm! This vacuuming robot definitely lets its presence be known. Thankfully, my baby can sleep through loud noises but I do limit the amount I use the Roomba during his naps. I try to use it while we are out of the house running errands or in another room. The noise doesn’t bother my son and he loves to crawl after it. He thinks it’s a game. That being said, if loud noises bother you this the Roomba 980 model may not be for you. In summary, if you are looking to add a robot vacuum to your home, the Roomba 980 is definitely worth considering. It’s smart, durable and works for the most part. It keeps my floors clean for my baby boy to crawl all over carefree. The Roomba has saved me time from cleaning to allow me to do other things. I am not wasting precious time vacuuming all day every day. Looking for the perfect Mother’s Day Gift? Give the gift of clean floors and time with a Roomba! I love my roomba. His name is Robbie. We even glued googly eyes on him to make it look like he was smiling. We’ve been able to use him through the whole house. The carpet in the bedrooms and living room is low. Super low. I hate it low. And the rest of the house is tile and wood. I run Robbie at least once a day. It has made such a difference in how the how looks. It forces me to pick the stuff up before he gets to it. I am jealous you got one to review. I would love another. Love that you glued googly eyes on Robbie. I definitely need to do that. My little boy is obsessed with him. They are lifechangers for sure! Thanks for taking the time to comment.